The global glue-applied labels market is foreseen to be advantaged by key and profitable trends such as the growing demand for premium appearance labels. Glue-applied labels could advent into newer segments in the next few years on account of the addition of upscale enhancements by market vendors, such as acid etch stimulation, soft-touch and matte finishes, and thermo-chromatic and embossing inks. The mounting demand for premium packaging could bode well for the growth of the market since such types of packaging are used for premium consumer offerings such as household items and cosmetics. Technological and innovative advancements could be a vital factor propelling the demand for glue-applied labels. 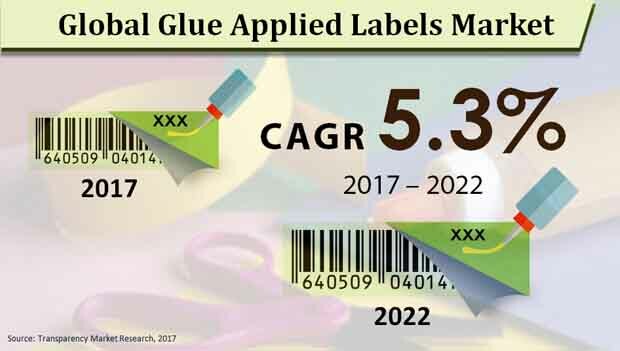 As per the statistics of seasoned analysts, the global glue-applied labels market could attain a valuation of US$25.3 bn by the end of 2022 at a CAGR of 5.3%. In 2017, the market exhibited its valuation of US$19.6 bn. The world glue-applied labels market is envisaged to be classified into paper, polypropylene, polyethylene, and polyethylene terephthalate (PET), according to face stock material. Out of these markets, paper could sustain a lion’s share of 56.2% by the end of the forecast timeframe. However, the share could showcase a slight drop from that achieved in 2017. The paper market for glue-applied labels is anticipated to garner an absolute revenue growth of US$0.5 bn between 2017 and 2022. This growth could be higher than that of other segments in the face stock material category. In view of segmentation by layer type, the world glue-applied labels market is envisioned to be segregated into laminated and non-laminated. On the basis of application, the market could witness a classification into food and beverage, pharmaceutical, tracking, logistics, and transportation, home and personal care, semiconductor and electronics, retail labels, and other products. Geographically, the international glue-applied labels market is prognosticated to witness the dominance of Asia Pacific except Japan (APEJ) by 2022 end. Apart from being expected to be one of the most attractive regions of the market, APEJ could secure its lead while growing at an 8.0% CAGR. It is projected to be followed by North America, although forecasted to expand at a lower CAGR, with a US$5.8 bn predicted to be earned by the concluding forecast year. Next on the list could be Europe with a marginally lower revenue but a higher CAGR than those of North America expected to be posted by 2022. However, Japan and the Middle East and Africa (MEA) are foretold to not impress much with their revenue share in the international glue-applied labels market. Japan could create an absolute revenue prospect of US$0.1 bn and the MEA could rise at a 4.1% CAGR during the forecast period. Some of the prominent companies in the worldwide glue-applied labels market could be Avery Dennison Corporation, Coveris Holdings S.A., CCL Label, Inc., Constantia Flexibles Group GmbH, Henkel, Lintec, Inland Labels, 3M, and WS Packaging Group, Inc. The global market for glue-applied labels is expected to expand at an impressive pace and account for a sustainable share in the global labels industry. The market is expected to benefit from the massive rise in demand for pressure-sensitive and sleeve labels. The retail industry is prophesized to continue to use glue-applied labels in the next few years. The market could also massively benefit from the vast rise in the availability of a variety of new products being launched in the global market, which is encouraging the packaging industry to adopt technologically advanced products. This report presents a thorough evaluation of the global market for glue-applied labels on the basis of criteria such as deterrents, growth drivers, segmentation, competitive landscape, and projections regarding the future of the market. Complete with a vast set of quantitative and qualitative data pertaining to all critical aspects of the market, the report could help readers develop smart and strategically most plausible decisions in their businesses. The report presents a complete account of the potential impact of the key factors that are driving and restraining the market. An overview of the key opportunities that could help shape the future for prospective competitors accounts for a good part of the study. The market is expected to register a promising growth rate over the period between 2017 and 2022. It is expected that the increased substitution of packaging products such as glass bottles and metal cans with plastic products could act as a major growth opportunity for companies in the global glue-applied labels market. However, the market could be negatively affected due to the rising competition from alternative packaging label varieties such as pressure sensitive labels. Nevertheless, the market could continue to benefit from the increased demand for sustainable varieties of products, which is one of the crucial trends for the market. So as to strengthen their hold on the global market, companies need to focus on the demand for specific requirements of novel packaging varieties. The report segments the global glue-applied labels market on the basis of four criteria: layer, face stock material, and application. On the basis of face stock material, the market has been covered for varieties such as paper, polyethylene, polypropylene, and polyethylene terephthalate (PET). Of these, the segment of papers is expected to account for the dominant share in the market by 2022. In terms of the type of layer, the market has been segmented into laminated and non-laminated varieties. The key areas of application for glue-applied labels covered in the report are home and personal care, food and beverage, transportation, semiconductor and electronics, retail labels, pharmaceutical, tracking, and logistics. Geographically, the report covers the market for glue-applied labels across regions such as Asia Pacific except Japan (APEJ), North America, Europe, Japan, Middle East and Africa. Of these, the market in APEJ could account for the dominant share in the global market over the report’s forecast period. The report presents a comprehensive account of the competitive landscape of the global glue-applied labels market, comprising detailed business profiles of some of the leading companies in the market, recent developments in the market, key business strategies adopted by companies to stay ahead of competition, and market share of leading vendors. Companies profiled in the report include Constantia Flexibles Group GmbH, Avery Dennison Corporation, Henkel, CCL Label, Inc., WS Packaging Group, Inc., Inland Labels, Coveris Holdings S.A., 3M, and Lintec.